This photograph shows Mr & Mrs. Sam Heaselden of Cropwell Bishop. Mr Heaselden is credited with starting gypsum mining operations in the village. In a local trade directory for 1904 his occupation is given as farmer, but in the directory for 1912 he is listed as a gypsum manufacturer. Regarding the motorbike, Notts motoring historian, Brian Waters, suggests that it is probably a Quadrant - a Birmingham based company, active 1901 - 1927. 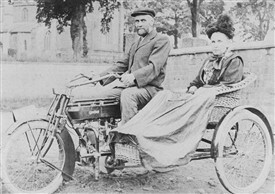 Mr Waters notes that Quadrant "used their own engines of various sizes and introduced a large side-valve V-twin in 1911, as in the motorbike pictured here, which I date at circa 1911. The direct belt drive to the rear wheel is also a Quadrant feature; as was the magneto ignition, with the magneto placed in front of the engine just behind the front mudguard". This page was added by Website Administrator on 21/07/2015.